Office Desk with Stationery, Calculator, Glasses, Green Flower and Clipboard with Paper and Business Concept – Referral Marketing. 3d Rendering. Blurred and Toned Image. All of the money that your plastic surgery practice spends on advertising and marketing can pale in comparison to the power of one single personal recommendation. we can’t “trust” it. But when we hear a personal recommendation from a neutral third party, we react differently. A third party doesn’t have an ulterior motive to recommend a product or service, they just want to pass along information about a pleasant experience. As such, their opinion carries far more weight than an ad. These third-party opinions from your patients are a necessary component of getting referrals. Today, many plastic surgery practices show that 60% of their business comes directly from client referrals. These newly referred patients are often more loyal to your practice than those who found you through other means. They may even spend more! 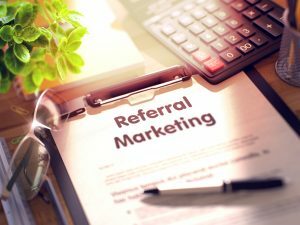 By putting more of your efforts into increasing your referrals, you may be able to rapidly increase the growth rate of your practice. Here are a few ideas on how you can do this. Your patient outcomes are only one factor in the overall experience of visiting your practice. Yes, if patients walk away with results they are thrilled with, they are likely to give you a good review. But if the entirety of their experience, from beginning to end, is spectacular, they aren’t going to be able to stop raving about your services, to everyone! The customer experience should begin well before a patient walks through the door. Ensure that you have an attractive, functional website, full of useful information that prospective patients can browse and learn from. Make sure that your social media channels are active and recently updated with new content. If a potential patient’s digital experience is great, then the in-person experience is already off to a great start. Your office should be a welcoming place for patients, not at all cold and sterile. The waiting area should be filled with current magazines (issues from 2012 won’t reflect well on the experience). Make sure the seating area is comfortable so their wait is as pleasant as possible. Train your receptionists to be professional, polite and helpful to clients. And when they see you for their appointment or consultation, be sure to be as responsive as possible to their needs and questions. Essentially, you want to be sure that your patients are having a great experience even before they tell you the procedure that they want. Imagine that a patient had an incredible experience at your practice. The customer service experience was excellent, the procedure went great, and the final results were thrilling. Despite all of these things, you still might not get a referral. Why? Because they simply don’t think of it! In order to get referrals, you have to be willing to ask for them. The idea of asking clients for a referral may seem awkward at first, but you have to go about it the right way. It isn’t a matter of looking them straight in the eye and asking them to recommend you to their friends. Genuinely thank them for their business, and mention that, if they can think of anyone else who might benefit from your services, feel free to send them your way. Make it light! As long as it is a request and not a demand, you won’t be putting any pressure on them. So don’t be afraid to ask! As scary as surgery can seem to some people, the recovery can be even worse. Patients may have concerns that they aren’t recovering fast enough, or that there might be complications, or that their results aren’t what they quite expected. By being readily available for follow-up, you can dispel these fears for them. Be sure that they know that you want to see them by sending them automated reminders to come in for follow-up appointments. By being there for them throughout their recovery, their overall experience will be significantly improved, increasing the chances that they will refer their friends to your practice after they’ve fully recovered. The prospect of a reward can be a fantastic motivation for people, especially when it comes to referrals. If your patients can get something by merely recommending your practice to one of their friends, they will! This incentive doesn’t need to be huge. It could be as simple as an Amazon gift card or a discount on future cosmetic services from your practice. Often, just that little extra push can encourage people to share their positive opinions about your services with other people, bringing more patients into your practice. Be sure to check your local and state laws, though, to find out what, if any, incentives may and may not be legally allowed. The best thing about referrals is that they can build exponentially on each other. If a referred client has a great experience, they are going to be more likely to refer you to others. It’s sort of like “pay it forward!” Word of mouth is, by far, the most powerful marketing strategy you have. Really, everything else you do should be in support of it. So, don’t be shy to ask for referrals. They might just be the way to super-charge the growth of your plastic surgery practice!